The benefits of trees are so overwhelming that the loss of them would ruin our lives and deal a death blow to this planet. Science clearly shows that our minds, relationships, health and economies are bettered by their presence, and their workload keeps our world on its feet. We know that orchards- the most efficient and environmentally friendly producers of calories this world has ever known- are the best way to feed our population. But I'd like to argue here that the there is no place that cannot be bettered by a tree planting. Whether it's a palm tree in Arizona or Saudi Arabia that provides shade to the world in defiance of the harsh desert, or a dwarf apple tree on a small quarter-acre plot in rainy New England, trees endlessly serve us. Stand before a towering oak tree and its hard not to stare in wonder at the massive scale of it and its odd sinuous limbs. Trees have eked out a place in our mythologies, religions, and the fabric of our culture for good reason. 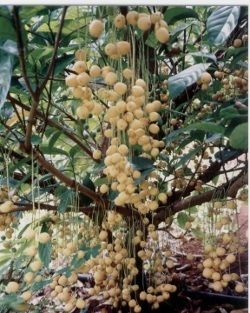 The Tree of Knowledge of Good and of Evil, The MesoAmerican and Norse world trees, Christmas trees, the Gerichtslinde trees of Germany, and the Bodhi Tree of Budhism are just a few examples. They also put the lauded works of man to shame with their staying power. The "big baobab" in Limpopo, South Africa has been carbon dated to be approximately 6,000 years old (1)(2). This would push it back to the building of the Pyramids of Giza, and thousands of years before the birth of Christ. 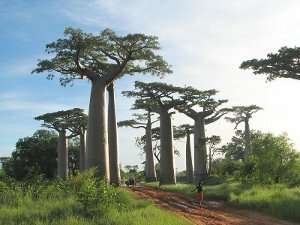 The pyramids are now crumbling, and 200 generations of man have come and gone, but still that baobab tree grows. Woven so closely into our history and culture, its no wonder that their presence, or lack thereof, can affect us greatly. You've probably been told that nature calms us, but did you know that a lack of trees can lead you to violence and and anti social behavior? There were fewer reports of physical violence in homes that had trees outside. Of the residents interviewed, 14% of those living in barren treeless environments said they've threatened to use a knife or gun against their children versus 3% for the residents living in green conditions. Residents who live near trees have significantly better relations with and stronger ties to their neighbors. Adults and children gathered more often in spaces with trees, compared to spaces with no trees. Children spend more time playing outside when trees are nearbye. They also engaged in more play activities characterized as "creative play" compared with children in stark play areas, who usually stuck to games with pre-existing rules like baseball. Trees reduce social service budgets, decrease police calls for domestic violence, strengthen urban communities, and decrease the incidence of child abuse. So convincing was Sullivan and Kuo's study that Chicago followed up with an ambitious $10 million tree planting initiative which installed 20,000 trees in the city. Are you sick or suffering from a disease? Maybe you'd get better faster if you had some trees around. One of the benefits of trees is that they literally make us healthier. Studies have shown that hospital patients with a view of trees out their window recover much faster and with fewer complications than those looking out onto concrete or other unappealing urban environments (4). A Texas A&M study indicates that trees help create relaxation and well being, and a U.S. Department of Energy study reports that trees reduce noise pollution by acting as a buffer and absorb 50% of urban noise. Trees save you money and increase the value of your property when you plant them in a good location on your land. Trees add $9,500, or more than 18 percent, to the average sale price of a house in the suburbs of Rochester, NY (5). Apartments and offices in wooded areas rent more quickly and have higher occupancy rates. Without trees, the great cleaners of our world, breathing in an urban environment would be even less pleasant than it is now. 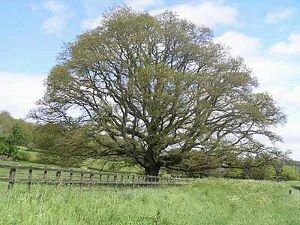 Trees remove gaseous pollutants by absorbing them through the stomates in their leaf surface (8). The absorbed pollutants include sulfur dioxide, which is released when petroleum products are burnt, ozone, nitrogen oxide, and peroxyacetylnitrate from cars, and small particles emitted from diesel fuel that can enter our lungs and cause respiratory problems (9). At the street level a tree can reduce pollution by up to 60 percent (10). If you have land, plant some trees. If you don't have some land, borrow some. Fruit trees can provide you and your family with plenty of healthy calories that cost you virtually nothing, year after year. They also clean your air, add to your soil, save you money, and help the economy. You can't go wrong with trees. 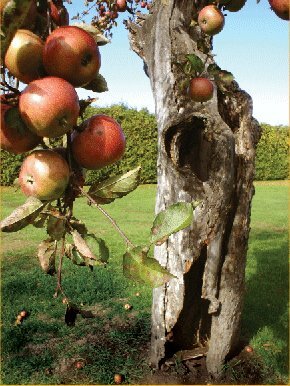 You can learn about following a healthy raw food diet that supports the spread of trees here. The benefits of trees in agriculture are vast, and you can read more about it here. (4) American Forests, “How Trees Fight Climate Change”, 1999. (6) American Forests, “The Case For Greener Cities”, Autumn 1999. (10) Coder, Dr. Kim D., “Identified Benefits of Community Trees and Forests", University of Georgia, October, 1996.